Growing productivity, in itself, is not a bad idea. But the rest of this story makes it pretty clear that – while Abe seems to be relaxed about the shrinking population (or at least resigned to it) – he is still obsessed with economic growth. One impossible and destructive quest down; one to go. Bravo to Abe for accepting a population contracting toward a sustainable level. Thanks to Reuters’ Linda Sieg and Kiyoshi Takenaka for sharing this with us, though I’m afraid the significance of it may be lost on them, based on my read of the report. All need to become familiar with limits to growth. 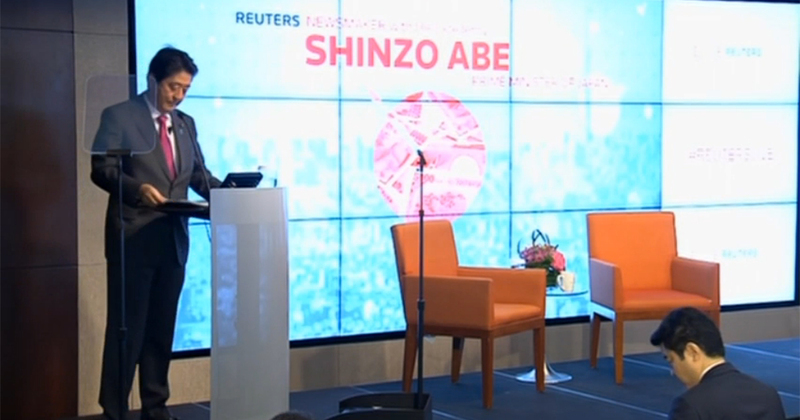 Indeed Abe does go on to talk about stabilizing Japan’s population at 100 million. That is still a very large population for a small chunk of land. But let us cheer because even a sliver of sanity is better than the insane nonsense that was recently flopped out like a stinking fish on the CBC TV program “Power and Politics”. There were were informed by Assistant Professor Ian Lee that the problem with the Japanese economy was “not enough babies”. It was all presented as fact, the interviewer wisely nodding agreement. Well, that is also the policy of the present government of Canada — and CBC knows who butters their bread. “Population growth to grow the economy” is the official policy platform of the Justin Trudeau Liberal Government. Even the much reviled Stephen Harper was not so brazenly aggressive on that matter. I definitely agree with your distaste for journalists nodding and accepting the “birth dearth” hand-wringing of growth boosters about population contraction or even slowing of population growth.